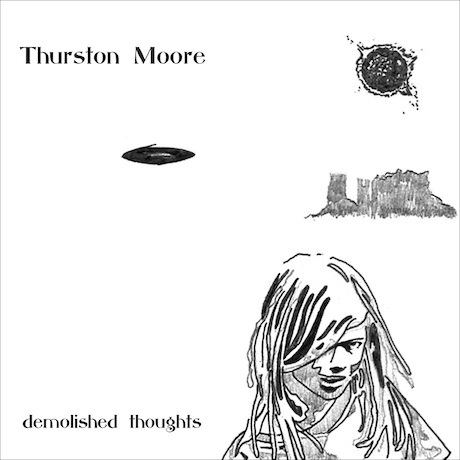 Thurston Moore’s 2007 solo album 'Trees Outside The Academy' – besides being truly excellent – was a step away from the world of Sonic Youth to a less electric instrumental line up with the violin of Samara Lubelski prominent, and with the subject matter of the songs being intensely personal. Although it did retain some solidly rocking songs, mostly featuring J Mascis (in whose studio it was recorded) on electric guitar. 'Benediction' is the first glimpse of his upcoming solo release 'Demolished Thoughts' and it goes further still in the direction of a gentler, more uncomplicated musical approach – viola (I think) and acoustic guitar take the lead. It’s a simple but beautiful song, perhaps a bit long for a "single" but intriguing in the context of the opening song to the album. It’s a love song, with lyrics that, I guess, may be metaphorical or literal - "you’d better hold your lover down, tie her to the ground....I know better than to let her go". Either way, 'Benediction' made me eager to hear the rest of the album, so the pre-release tactic seems justified - and the same could be said for the choice of eschewing the screwdriver in favour of simple finger picking on the part of Thurston Moore. 'Demolished Thoughts' arrives in May on Matador Records.